You can always rely on 97-year-old Joyce Schmalz to turn the worst situation into an opportunity for change. When the Nazi bombing raids over London in WWII made it impossible for her to attend university, she joined the British Military Police. When she came to Canada, she found a way to provide for herself and her two daughters; and when her youngest daughter, Angela, died in a car crash just weeks before Christmas, Joyce found a way to persevere. So it should come as no surprise that when she saw the system was failing seniors she attempted to balance the scales. 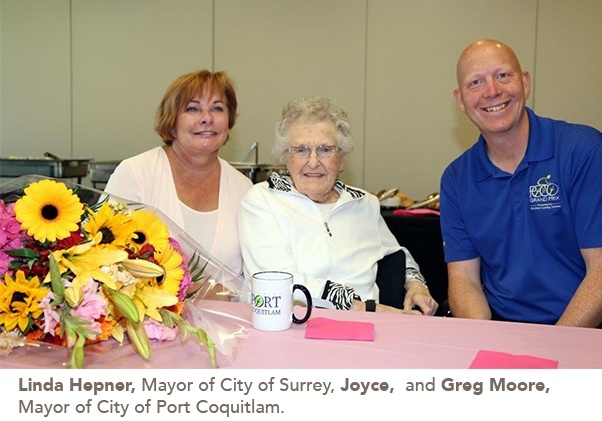 Joyce received the City of Surrey’s ‘Lifetime Achievement Award’ in 2013 for her work helping seniors; which included co-founding the British Columbia Centre for Elder Advocacy and Support in 1982, which recently changed its name to Seniors First BC. For Joyce and the seniors she’s helped, the journey all started when Joyce retired to spend more time with her husband, Bill Schmalz. “After about a week or so [of retirement], I just missed — it wasn’t the people so much, but it was the work,” Joyce said. She began working one day a week at a communications centre helping seniors fill in legal documents. 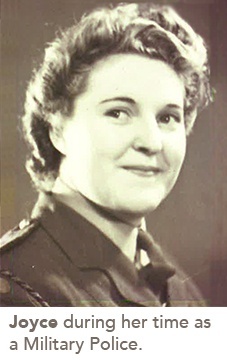 After some time there, one of the paralegals who worked at the centre asked Joyce if she would be able to write a report for her, and Joyce, who had written several reports when she was part of the British Military Police, cheekily asked her if she’d like the report written in English or French. And then the house calls started. Joyce went out to visit seniors who were being taken advantage of in some of the worst ways, including being robbed by their families through the misuse of power of attorney. Hearing the stories of abuse from fellow seniors inspired Joyce to start putting together a list of resources. The biggest problem, in her opinion, is that many people don’t understand the laws or how certain decisions may affect them in the future. Helping senior understand their options has always been Joyce’s main goal. It’s why she wrote and starred in an educational film, ‘Finding a Future for Ellen,’ which follows the story of a widow who’s being taken advantage of by her daughter. Filming was done in Joyce’s house, and Joyce stars as the main character, Ellen. Joyce had done a great deal of acting in seniors’ clubs before, and so wasn’t nervous about acting. ‘Finding a Future for Ellen,’ along with many of the other resources Joyce developed for seniors, can be found on the Seniors First BC website, which Joyce is still involved in as an honourary board member. Joyce moved from Surrey to Mayfair Terrace Retirement Residence in Port Coquitlam in 2017, where she’s continued to advocate passionately for seniors. It’s a guarantee that Joyce will continue to make strides in seniors’ equality in the years to come.